I haven't read an Ann M. Martin book since chomping my way through the Babysitter's Club books 20 years ago! To be honest, I thought she was a pseudonym, similar to Carolyn Keene. 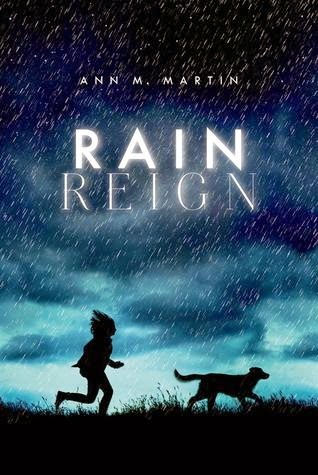 It was fun to see her name on the cover of Rain Reign, which one of my students was reading. I decided to read the book when Sophie finished. Rose Howard is a highly functioning autistic child who has an obsession with homonyms. She lives with her impatient father and a sweet dog named Rain, whom her father found for her. Life isn't easy for Rose, but having Rain helps, until Mr. Howard lets the dog out in a superstorm and he doesn't come back. Most notable in Rain Reign is the peek into the mind of a child with Aspberger's Syndrome. Every time there is a homonym in the book, its variants are written in parentheses. For example, choose (chews). As an adult reader, I was able to skim over these frequent interruptions, but I wonder about their effect on developing readers. I imagine it would get pretty annoying, and am eager to ask my student about it when we return from winter break. It's not a groundbreaking book, but will appeal to the dog lovers in my 5th grade classroom. I also think it is helpful for kids to get an idea that the inside of everyone's heads are not the same.